The European Robin (Erithacus rubecula) is a small insectivorous passerine bird. It is found in Europe, east to West Siberia and south to North Africa. 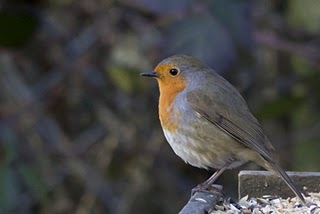 A fully-grown European Robin is 12.5–14.0 cm (5.0–5.5 in) long and weighs 16–22 g, with a wingspan of 20–22 cm (8–9 in). The European robin is relatively unafraid of people and likes to come close when anyone is digging the soil, in order to look out for earthworms and other food freshly turned up. Because of its high mortality in the first year of its life, it has an average life expectancy of 1.1 years. European Robins approach large wild animals like wild boar which disturb the ground, to look for any food that might be brought to the surface. In autumn and winter, they supplement their usual diet of terrestrial invertebrates, with fruits and berries. They also eat seed mixtures placed on bird-tables. Hummingbirds are small birds that belong to the family Trochilidae. The name 'Hummingbird' is derived from the characteristic 'hum' made a hummingbird's rapid wing beats. Most species of hummingbird have an average length of 7.5–13 cm. Hummingbirds are the only group of birds that can fly backwards. They can hover in mid-air by rapidly flapping their wings 12–90 times per second (depending on the species). The smallest living species of hummingbird is the Bee Hummingbird. On average, it measures about 5 cm in length and weighs about 1.8 grams. It is indeed the smallest living species of bird. The average lifespan of a hummingbird varies from species to species. Though many hummingbirds die during their first year of life, especially in the vulnerable period between hatching and leaving the nest, those hummingbirds that survive may live a decade or more. The longest recorded lifespan of a hummingbird in the wild is that of a female Broad-tailed Hummingbird (Selasphorus platycercus) that was banded (ringed) as an adult at least one year old then recaptured 11 years later, making it at least 12 years old. Other longevity records for banded hummingbirds include an estimated minimum age of 10 years 1 month for a female Black-chinned Hummingbird (Archilochus alexandri), and at least 11 years 2 months for a much larger Buff-bellied Hummingbird (Amazilia yucatanensis). Generally, hummingbirds have bright plumage with marvellous colouration. In many species, the colouring comes from prism-like cells within the top layers of the feathers. When light hits these cells, it is split into wavelengths that reflect to the observer in varying degrees of intensity. The wing structure of a hummingbird acts as a diffraction grating. The result is that, merely by shifting position, a colourless bird will suddenly become colourful. However, not all colours of hummingbird are due to the prism feather structure. The rusty brown color of Allen's Hummingbird (Selasphorus sasin) and Rufous Hummingbird (Selasphorus rufus) are due to pigmentation. Iridescent hummingbird colors actually result from a combination of refraction and pigmentation, since the diffraction structures themselves are made of melanin, a pigment. Most species of hummingbirds have long and straight bills, but in some species the bill shape is adapted for specialized feeding. Thornbills have short, sharp bills adapted for feeding from flowers. The male Tooth-billed Hummingbird (Androdon aequatorialis) has barracuda-like spikes at the tip of its long, straight bill. The bill of the Fiery-tailed Awlbill (Avocettula recurvirostris) has an upturned tip. The extremely decurved bills of the Sicklebills are adapted for extracting nectar from the curved corollas of flowers in the family Gesneriaceae. Hummingbirds drink nectar, a sweet liquid inside certain flowers. They have the ability to assess the amount of sugar in the nectar they eat; they reject flower types that produce nectar having less than 10% sugar and prefer those whose sugar content is stronger. Hummingbirds meet their needs for protein, vitamins, minerals, amino acids etc. by preying on insects and spiders as nectar is a poor source of protein. Hummingbirds spend majority of their time in sitting and perching. They are known to consume nectar twelve times their own body weight each day. They spend an average of 10–15% of their time feeding and 75–80% sitting and digesting.